TLDR: 5 start out of 5 - Loaded with great material and a certain wow factor. Monster Island is an isolated, monster infested yet inhabited volcanic island located in the middle of an ocean in the setting of your choosing. It's clearly inspired by both 19th C. adventure writing (both fictional and factual) and by pulp Sword and Sorcery stories of the early 20th C. - particularly those of Clark Asthon Smith, whose spirit is all over this book. The island itself features jungle-covered valleys sloping up to steep-sided 10,000' tall mountains, beyond which is a cold and arid plateau, surrounded by even more improbably high mountains. Dispersed around the island are a number of ancient magical gates, perhaps once used to travel the planes, but now basically only allowing travel to the island, and its through these gates that the eponymous monsters make their way to the island. There are three humanoid cultures on the islands. Nestled tenuously in the ruins of an ancient city on the coast is a town of human 'settlers' (castaways, more like) trying to eke out an existence from the bounty of the island. The surrounding jungles and lower mountains are home to a number of lizard-man tribes who live in rudimentary villages and practice unsavory cultural rites. Hidden in these high mountains and three very old cities inhabited by what's left of the ancient ophidian sorcerers who once ruled the island. They have a unique culture and magic system. If you can mash up the Big MT add-on setting to Fallout New Vegas and the underground telepath culture from Beneath the Planet of the Apes, you'll kind of get the vibe. 1. The Island. (12 pages). This first chapter describes the geography and possible location of the island. **2. History & Cultures (24 pages). **This section gives a brief history of settlement on the island and provides an overview of the three cultures on the island. These are good, and the 'Savages' in particular are very well done - as good a model of fantasy culture-building as I've seen anywhere. The cultural practices of geriatricide, skinning opponents, cannibalism, and shrinking heads are designed to seem unsavoury to outsiders, but to make complete sense from the point of view of those practicing them, which is a very nice touch. 3. Settlements (22 pages). This section describes the one human settlement and a sample native settlement for each of the other two cultures on the island, along with the notable personalities of each. In some ways, this is a continuation of the culture chapter and rounds things out. Things get a little campier here, especially in the naming of NPCs, and although personalities like Persval Fawset, Harrick Hoodin, Artuur Doyal, and Gorge Ivrist certainly reveal the setting's inspiration, they also obviously contrived and undo somewhat the careful setting work of the previous chapter. Also, this chapter could have benefited from much better illustrations of the places, IMO. But these are minor points - the mind's eye does a pretty good job. 4. Places of Interest (47 pages). This section describes a number of locales around the island, from ancient causeways and valleys to enormous carvings, tombs, and temples to unspeakable gods. Some of these are deadly tomb-raider style dungeon crawls, while others are clearly the setting of more social encounters. All of them are will stocked with plot seeds that give you many different ways of using these in your game. Many could also be plucked from this setting to be used elsewhere without much effort. Twelve places are given a full description, and another 15 are given a smaller and more suggestive description. **5. Campaigns (14 pages). **This is the GM section, and it talks about themes, scenario seeds, how to run a campaign, and has encounter tables. 6. Magic (34 pages). The Magic chapter details the magic used by three cultures on the island. Each of these riffs off one of the magic systems described in the core Mythras book - Theism for the humans, Animism for the Savages, and Sorcery for the old ones. Like the cultures, these are extremely well done and are a great model for anyone who would like to see how you can adapt core Mythras to your own setting. I particularly liked the Sorcerous schools and the magical mishap table - this really feels like S&S sorcery! Except for the spell names, which rather jarringly sound like they were dreamed up by a delirious oxford don rather that a culture of snake-people. Pete Nash obviously has a deep love for the sesquipedalian word! 8. Flora and Fauna (93 pages). And finally the monsters, of which there are a huge variety, mostly taken from Asian and island myths from around the world - a few are made up and unique to this book. Most, I'll warrant, you haven't seen before, even in D&D. Some of my favourites are the Lakooma, and giant hand-like sponge that plucks people from the shores of the lake, and the Polong, a nasty sorcerous homunculus made from the blood of murdered people. Almost all of these have come through the gates and are now naturalized on the island (and strangely, they've come through the gates with name tags telling everyone what the name of the creature is in its place of origin, so even though there don't seem to be any Japanese people on the island, everyone still calls the monster Hitotsume-Kozo rather than by some name in the local languages). Appendices (10 pages). This contains stats for generic encounters, but also describes the Gods That Walk, local sleeping gods that can be awakened to walk (and fight) kaiju-like across the island. These are treated more like forces of nature that creatures, and that's pretty cool. Rounding out the book is an index and a large, folded map. The map reveals the locations of many things, and is useful for GMs, but maybe less useful at the table if you want players to discover the locations of things, rather than reveal them in one full swoop. There's also a supplemental companion pack available in PDF format only that has the stats of major NPCs and a map. The map is 'layered' but it is only cursorily so. If you wanted to turn on the one hidden city that the PCs have discovered, you couldn't do that - you'll have to turn on all of them, or none of them, which makes the layering not all that useful, in my opinion. 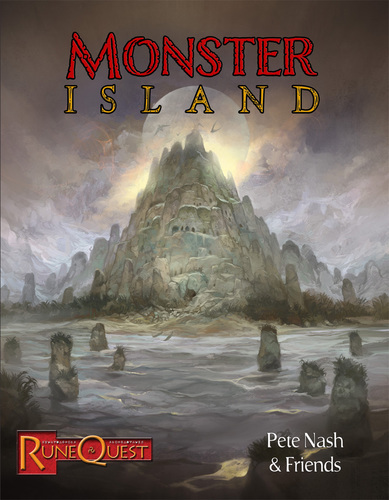 To conclude, Monster Island is a great RPG supplement, just loaded with goodies. It's got cool local cultures that will probably give your players back some of that wow factor. It's got interesting (and deadly!) locations to explore. It's got exotic and dangerous monsters to fight. It's got weird and wonderful magic and gods that your players can try to master, worship, or flee from. It's got trippy narcotics, poisons, and diseases. And it's loaded with plot hooks - both described and implied. Gaming aside, the book is also a wonderful example of how to create setting material, how to be inspired by the Mythras core systems to create your own setting, and how to build and run a sandbox setting. Altogether, that's a lot of bang for your buck! I score this one 5 out of 5. It's just loaded with good material - more than most people would reasonably expect - and some of this material has that Wow! factor. If you like Mythras, this is a must buy.